This is a sponsored conversation written by me on behalf of Ball Park® brand. The opinions and text are all mine. Still holding onto what’s left of summer? You’re not alone. And you’ll just love this Watergate Salad to pair with Ball Park Park’s Finest hot dogs for your next summer grilling get together. School is back in session here, but that doesn’t mean summer is over and we are taking advantage of every single last beautiful evening we can. The weather has dropped a little and it’s simply gorgeous out there and it’s the perfect time to throw a Grilling Get Together! What makes a grilling get together so great is that it’s so easy to do. 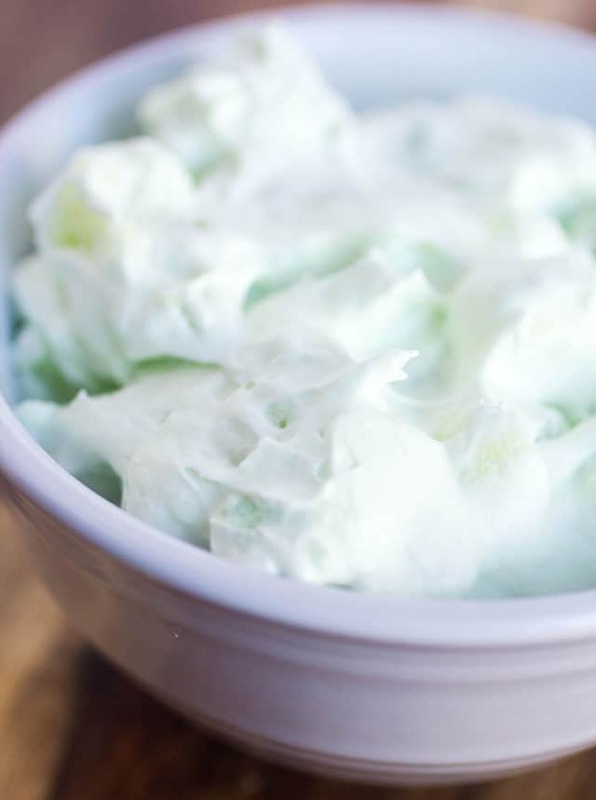 Throw some Ball Park Park’s Finest hot dogs on the grill, make up a couple of easy sides, like this Classic Watergate Salad and you have yourself a get together fit for a king (or just a few neighbors aa nd friends). When it’s time to whip up the side dishes for a grilling get together, I usually turn to the classics like cold pasta salads, potato salads, cole slaw, fresh fruit and other classic sides. One of our favorite sides we LOVE pairing our grilled items with, is this delicious Watergate Salad and it’s SO easy to make. Chances are your grandma has been making it for years, I know mine has. Plus it can easily be doubled, tripled and prepared ahead if need be. So why do I choose Ball Park Park’s Finest hot dogs? Well, the beauty is that they are already seasoned. So there isn’t any need for additional condiments like ketchup and mustard. Eating them plain is a flavor explosion in your mouth. There are available in five great-tasting, bold flavors: Jalapeno Cheddar (my fave! ), Slow Cooked Chili, Signature Seasoned, Slow Smoked Hickory and Cracked Dijon Mustard! And while you’re enjoying your fun grilling get-together, don’t forget to check in on the #FinestGrillathon event in New York City. This event is where grillmasters team up with Ball Park to break a world record for the longest marathon BBQ! The record is for a marathon BBQ that lasted 30 hours and won by the British. #FinestGrillathon event wants to bring the record back to the US! In a large bowl, stir the pudding mix and crushed pineapple together. Fold in the marshmallows and chopped walnuts. Fold in the whipped cream and stir just until combined. For best results, refrigerate at least 2 hours.